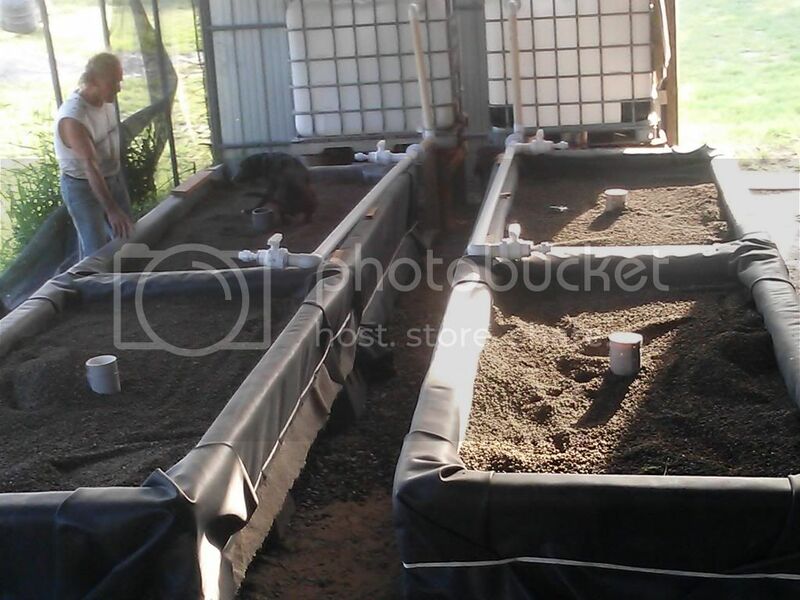 Backyard Aquaponics • View topic - System Issues...any advice on IBC FT filling to GB?? System Issues...any advice on IBC FT filling to GB?? Post subject: System Issues...any advice on IBC FT filling to GB?? Currently the IBCs have holes cut into the sides near the top and a PVC fitting is screwed on so that there is a rubber seal between the plastic of the IBC and the fitting. Then I put a water proof "putty" cement around the outside to seal it even further. This is not working at all. The seal breaks and every time the system turns on there is a major leaking problem. The FT are propped up on wooden structures so that the bottom of the FT are level with the top of the GB and the GB and FT are about 2 feet away from each other. I currently have a pump in a sump tank in the ground that pumps water into the FT, which then gravity drains through the PVC piping to the GB (which eventually gravity drain back to the ST). Does anyone have any ideas on how I can change the system to fill the grow beds? I am trying to stay with only one pump in the ST and gravity drain the rest. Can I go out of the top of the IBCs somehow and not have to worry about putting holes in the side of them? Is there a better way to seal? Post subject: Re: System Issues...any advice on IBC FT filling to GB?? There was a thread recently where the member (in England iirc) wasn't using seals. Instead he would cut a hole in the IBC that was smaller than the pipe, use a heat gun to soften the IBC and then push his pipe through, which pushed the soft material into a lip around the pipe (then he used some silicone I think for insurance). I used silicone (for aquariums) to seal the leaks, and it worked fine. Try to seal it also from the inside of the tank, because the pressure will be bigger. The rubber not always work, I had to use silicone in lots of places (with good results). Have you heard of Uniseals? I ended up using the Uniseals. They worked great!! I will definitely recommend them for others...and I'll keep the silicone option in mind for the future. Thank you all for your info. and help. I'm glad it worked out! Is the dog still getting into the GB's?